16 Night South America Explorer Cruise departing from San Antonio to Miami onboard Norwegian Sun. Make your way along the stunning western coast of South America on a cruise that includes transiting the one-and-only Panama Canal. In Santiago, take a funicular ride for wonderful views of the harbour and the surrounding hills. When calling at Arica, Chile's northernmost city, enjoy an overnight expedition to the marvelous ruins of Machu Picchu, a 15th-century Inca citadel. Head just outside Manta, Ecuador, to Montecristi - birthplace of the Panama hat - for charming colonial architecture. Also transit through the Panama Canal, making your way through all of the Gatun Locks. And make time when you arrive in Miami to explore the trendy Art Deco District in South Beach and Little Havana's Calle Ocho. San Antonio is your gateway to Valparaiso, just 30 miles up the coast. There, enjoy the charm and colours of the hillside old quarter, or visit lovely nearby Viña del Mar and its famed floral clock. Head inland to Chile's scenic Central Valley, the country's breadbasket, and on to the Andes with their world-class vineyards and ski resorts. Or spend the day in metropolitan Santiago, considered the safest city in Latin America. Known as the “City of Eternal Spring” for its verdant valleys and sublime climes, Arica is a lush city amid the Atacama Desert where humans have been living for the past 10,000 years. Look out for Morro de Arica, important not only to the history of the region but a great view for those who make it to the top of this hill on the harbour. Explore more of Arica on a South America cruise! Arrive in Callao, the chief port of Peru, right outside Lima to a place where fishermen in colourful boats fit right in to the picture alongside our ship. Trading routes of the 16th century saw goods from all over Peru make their way across the Andes (by mule!) to Callao, for ships headed to Spain. We dock in the port town of Salaverry in Trujillo, a historic city on the banks of a picturesque river in the Moche Valley. While it bustles like an emerging modern city now, it was once home to the great prehistoric cultures of the Moche and Chimu. Pristine beaches, picturesque villages and a unique tropical dry forest await your exploration outside Manta. Or spend your day discovering the charming atmosphere and colonial architecture of nearby Montecristi, which was founded in the early 1600s. As the birthplace of the famed Panama hat, a stop at Montecristi's local hat shops to view these pieces of woven art are a must while touring the small town. Stroll the seaport town with its multi-coloured cottages and local markets. Head to Carara Tropical Rainforest to explore exotic flora and fauna with a naturalist guide. Or opt for a tour of San Jose - home of the Teatro Nacional and Museo del Oro. Experience one of the world's best short cuts! Journey 40 miles through the Panama Canal for an unforgettable experience. Witness first-hand one of the world's manmade short cuts that has changed travel and the transport of goods worldwide. The old walled city of Cartagena reflects a turbulent history of conquistadors and pirates. Climb "las murallas" for an unforgettable view of the harbour. Shop for emeralds and leather goods along the cobblestone streets of this enchanting city. Looking for a cruise to Cartagena? 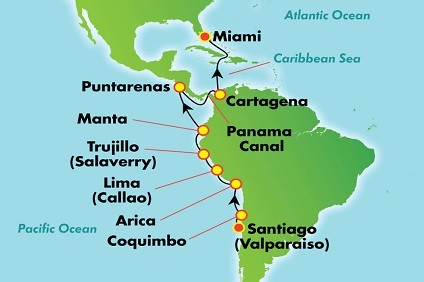 Check out our selection of Panama Canal cruises.